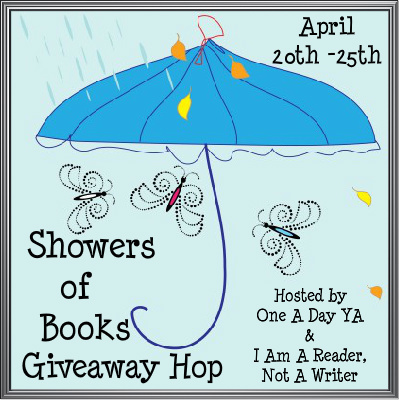 Showers of Books Giveaway Hop!!! Click Her To Find Over 200 More Giveaways!! I truly want to shower you with books in this giveaway!!! So there will be only one winner!! The Winner will receive 10 BOOKS!! Wow…I really want this one….all the authors I want to try or already follow…thanks! Thank you for such a generous giveaway. May April bring you lots of luck! Now this is an AWESOME giveaway. I have a few of those book already, but the chance to win the rest from that list is something I won’t miss out on. Wow! missy I am overwhelmed with this shower of books giveaway opportunity, my eyes are crossed, the chins are hitting the floor, and I feel a happy dance coming on 🙂 Thank you so much for your generous participation in this hop! Wow, this is quite a downpour!!!! There are some books here that I am longing to read. Thank you so much for this giveaway. I am so glad you like this giveaway!!! I really wanted to make it special. Love raining books, don’t you??? Wow, what a generous giveaway!! Thank you!! Thank you very much for the awesome giveaway.